Luminizing pearl insantly brightens skin tone. Spectacular results - freedom from dullness, skin stays young. 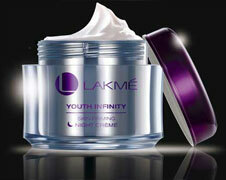 Lakmé Youth Infinity Skin Firming Night Créam helps repair your skin while you sleep, giving you younger looking skin. It re-generates your skin's own youthful brightness & tightness overnight. The cleansing liquid transforms into a light, rich foam that washes away all impurities, dirt & pollution without drying the skin. It prepares the skin for maximum absorption & makes the most out of your skin care regime. Lakmé Youth Infinity Skin firming Serum with its translucent pearly sheen has a luxurious feel. It is an intensive treatment that penetrates deeper into the skin giving you bright and tight, younger looking skin. It glides over skin, blending smoothly for an even application.